MADRIX® STELLA allows a direct connection to DMX fixtures to control 2 DMX universes. 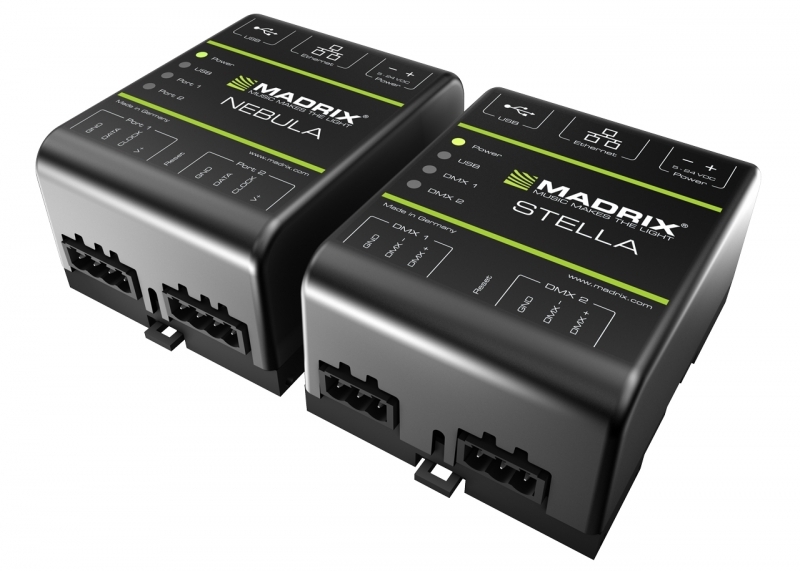 MADRIX® NEBULA provides brand-new possibilities thanks to its direct connection to a wide range of digital LED strips, stripes, and tape based on SPI chipsets, such as the WS28XX series and many more. Up to 1,360 RGB pixels can be controlled per device. The hardware design makes mounting on walls or DIN rails quick and easy. Control data is simply sent to a device over USB or computer network (Art-Net). Thanks to quality 'Made in Germany', they both also feature the MADRIX® synchronization mode in order to synchronize colors, visuals, and effects. This results in an optimal image without visual interruptions on the LEDs. Any small or large LED installation greatly benefits from these and many more features.